So here are some basic weaves. Well some of these are not so basic. . . ANYWAYS. . . 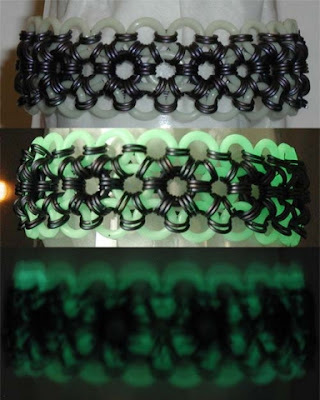 Remember that I will be using these examples as bracelets. There are TONS of examples of these as necklaces. Be warned, necklaces will gost around double of what I price on here based on length of the necklace. Prices can also vary based on the Gauge of the wire used. Smaller wire increases time to make these beauties and thus the price. "One must ALWAYS value the time they put in"
Let us start with one of the MOST beloved weaves. No it is not European 4-1 but Jens Pind Link also know as JPL. Now the most interesting thing about this weave is that if made too loosely it actually can unwind itself! If you look every link that is facing up (top of the ring is towards you) it is suspended by its brothers on either side. JPL is also a bother to weave. Some bracelets (7.5" to 10") take upwards of 6-10 HOURS to make! The simple reason of why it takes so long is because when you weave JPL, you have to CONSTANTLY readjust the link so they do not Unweave! It is a major issue with this particular weave. Couple with the Tight Aspect Ratio (AR) JPL is a costly piece of chain. A basic Copper one that looks like this could EASILY run $150+ and that is just at 7.5" long! 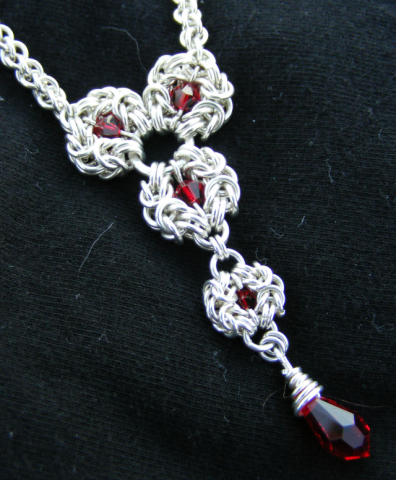 Split Anodized Aluminum Bright Silver Byzantine Necklace with some Ruby Beads. So here are 2 GREAT examples of Byzantine! 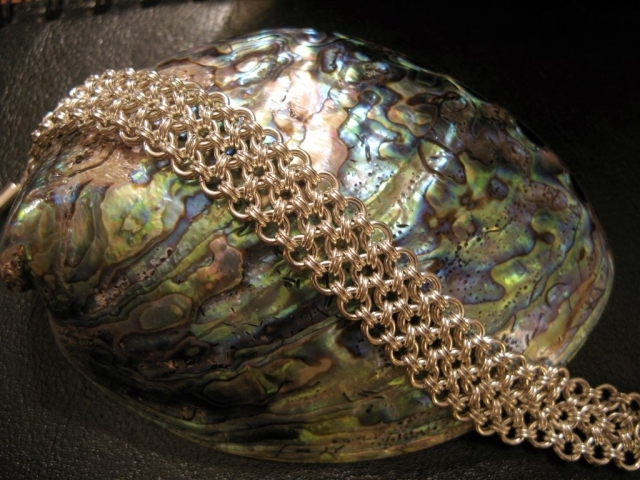 Byzantine is also know as the Bird Cage Weave and it amazing! OH Let me apologize for the size of that Necklace picture. It was hard to see the links at any other size! 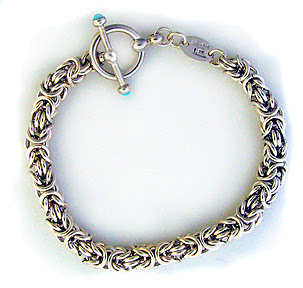 In the first Picture we have a basic silver Byzantine bracelet about 8" or so long. This weave is great for guys and gals. Now being a guy myself I am not sure why we like this style, it just is really appealing. . . Maybe I should do a Poll!!! Byzantine is a pretty complex weave, now no where as near as JPL though! 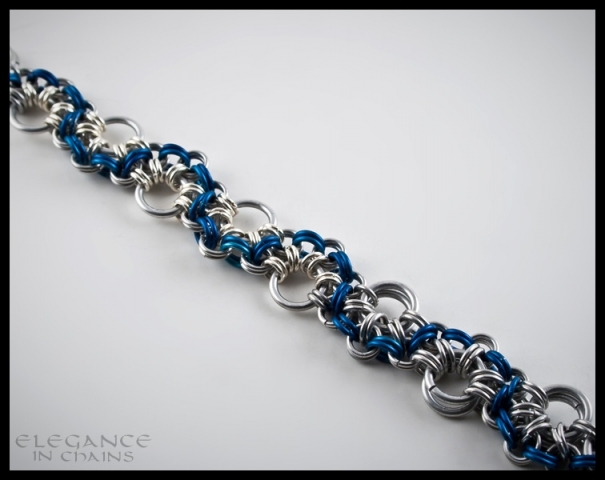 It takes maybe 3-5 hours for a 7.5"-10" bracelet. It gets easier once you get started and there are a couple of ways to speed weave it. 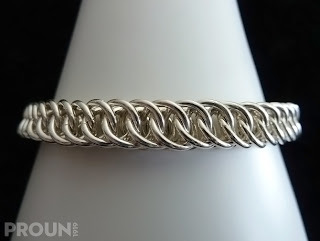 Thankfully because of this a basic bracelet as shown in basic Stainless Steel would run you $40-$70, and it gets more expensive based on what you want used. Copper and Silver are very popular but are also expensive! Now here is the sister of the Byzantine. 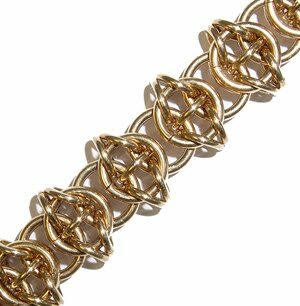 Now this is the Queen's Link Chain. It will look simmilar to 3 of the weaves I will present to you. First of all the Basic comparison is to the Byzantine. If you look at the cages of the Byzantine, you will see the links that make up half of those cages. NOW the difference is now noticiable between the two. Byzantine is linked and reversed but the Queen's Link is not. Another Comparison would be to the very beautiful Full Persian which is next on our list. 2 MAJOR differences there. First the Links are not as tight for the Queen's Link compared to the, which leads to the second difference. The second difference is that the links of the Full Persian are INSIDE the link behind it. The Queen's Link on the other hand have the ends of the links on the outside. Do not worry you will see it later. It took me a good 10 minutes to figure that one out on my own. . .
NOW about the Queen's Link. It is a simple weave as they go. By no means a Box Chain which is the last chain it looks similar too. The Weave takes roughly 2-4 hours to make the standard 7.5" - 10" bracelet meaning that they are not as expensive as the last two weaves we have looked at tonight. It is by no means the most inexpensive but it is in the top 3 or so. You are looking at a copper version of this bracelet at about $30-50 based on size as usual. Oh god, the pretty boy of chain. . . I am not kidding. . . here let me show you! Look at this thing! 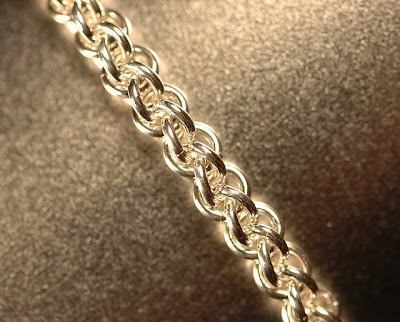 In copper or silver guys love this weave, make it gold or silver women swoon. This weave does it all. It is also one of the easier to make. All you really have to do while weaving it is to make sure that the new links are split into the V shape that you see. Simple and rather inexpensive. 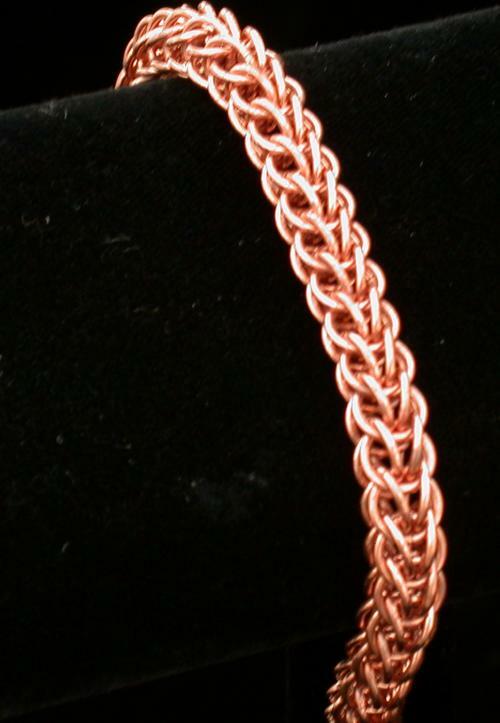 Full Persian Bracelets run anywhere from $45 in copper like the one you see here to $80 foother medians. They take about 3-4 hours of work and look AMAZING! Now there are MANY other variations of Full Persian, Just like the European 4-1 there is Full Persian 6-1 and even 8-1. The tricky part of Full Persian is that when you make a link you have to loop the connecting piece through a tip of the V infront of the one you are putting in. Here is a picture. . .
Can you see it? Looks simple but you need a good AR in order to make it work. Too tight and it will NOT bend, to loose and well. . . like water is a great term. Oh here is a great looking weave! So Celtic Visions, god what can you NOT do with this weave. . . I have seen stars (Made said star as well for a pendant of a Scale Necklace), Bracelets, Heart pendants, the List goeson and on really. This is a rather simple weave as you can see the "Points" of the bracelet are atcually only being held inplace by how tight the interjoing links are. This weave requires 2 different sizes of rings to work. A chain for a Bracelet with this weave can take upwards of 2-3 hours making this a really inexpensive gift during the Christmas Season. 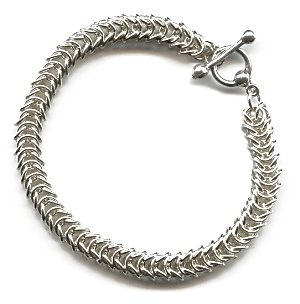 Average costs place this chain at for bracelet length at about $30-45 which is pretty good if you ask me. Let us see what is next shall we! Half Persian is just that, it is HALF of the Full Persian that we looked at earlier. Prices vary from $25-45 depending on length, and as always materials and gauge of the rings change this often. This will be one of the first projects I will post up on my blog when my material reach me! Helm chain is just that, what they use to do to link helms to one's chin. Now it is an attractive work of art. You need two different ring sizes and some patience but the result is stunning. 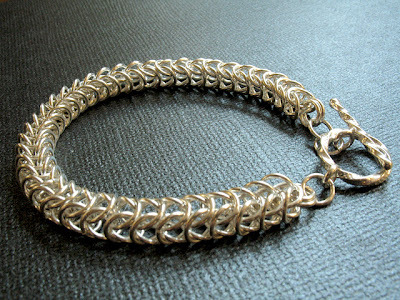 Time to make these vary as all Chain Maille do, it is based on the size and AR maily for this weave. A TIGHT Helm Chain takes much longer to work with because of getting those pesky links connected. Cost is pretty good I would say, due to taking anywhere from 1 hour to 3 hours on a good day these rainge from $20 to $50. Still with the right colors these look amazing! So there is a reason for the blanks. Here let me show you! So Japanese's first number is based on the ammount of connectors on a middle ring and and the number of that center ring, so all of these are 12 in _. Now Japanese takes TIME to make, it is really consuming but beautiful when completed. The third picture shows a BEAUTIFUL necklace, this makes Japanese _ in _ so attractive to people. The weave can also be used to make a flower form as shown in the second picture. 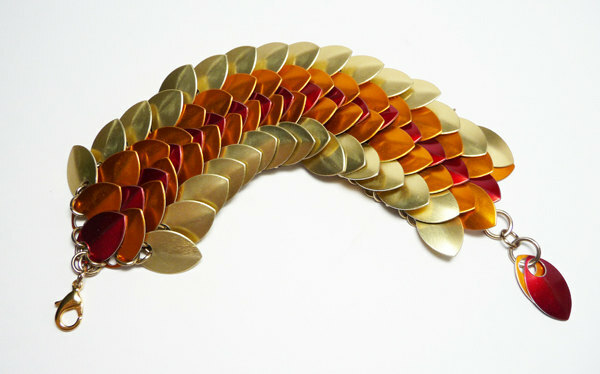 Due to the time a bracelet takes, the pice can range from $80-120 basedon length and ring size. Time is like 5-8 hours but is all consuming at best. There are room for mistakes but due to the size of the connecting rings it is hard to fix them at times. Ahh a favorite of women almost everywhere. The Stepping Stones. 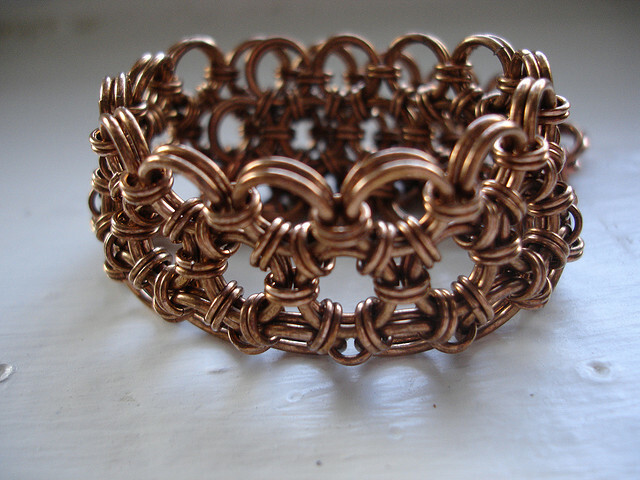 This is a slightly complicated weave requiring three different sizes of rings! Now this looks like a Japanese style of chain and it almost is. It is actually a variant of Japanese 12 in 2 and Hodo (will do Hodo at a later date!) Stepping Stones have some amazing works. The whole weave is based on how far you wish to go arounf the large ring. Here let me show you a set of earrings that impressed me greatly with this! See these earrings! Sorry for the large picture but I want you to see what I mean about being able to go almost all the way around. I have seen a few examples of this weave goingfurther up the large rings. Now these take a ton of time, this is due to using the different sizes of the rings and how they are woven with each other. Some weaves are looser and require less time because they almost put themselves together. The tighter ones require work to get them together. Priced, Stepping stones will run for a bracelet $45-90. Earrings are easier, about $30 for a set. Time to make, you are looking at 2-5 hours all based on AR. 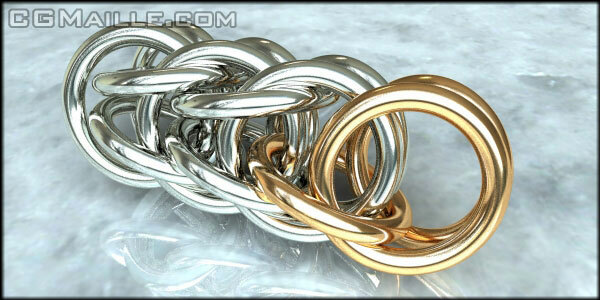 So as you can see, the Box Chain looks a lot like the Queen's Link and Full Persian. There are som differences. First, the Queen's Link is further spaced apart compared to the Box Chain. Second the Full Persian has the V's going right into the next one, the Box Chain doesnot have this. The Box Chain takes roughly the same amount of time that it would for a Queen's Chain. So the price is the roughly the same. Now the Box Chain is a favorite of guys, it could be because it is a heave chain with a tight weave, it could be because it is like the thought of protection, or it could very well be because we just like the look of it. Who knows right? You know what Why don't you all tell me what you think! Well I am off! I have commissions to plan and to work the details out! As always if you have ANY just let me know!